It was probably the first time Yung Bleu’s hip-hop had been used to teach physics. Yet, in Marco Cavaglià’s University of Mississippi classroom during spring break, the artist’s music played, causing the electronic waves of an oscilloscope to bounce and jiggle with the vibrations of the music. 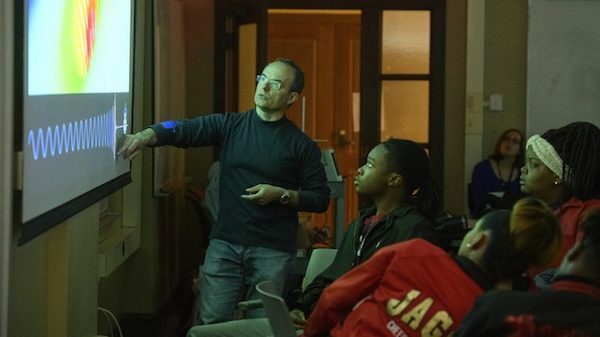 Huddled around the oscilloscope, learning about gravitational waves through the Alabama artist’s work, stood 28 Mississippi high school students from rural school districts, visiting the UM campus during spring break as part of a Global Teaching Project program. The program is an initiative to provide potentially high-achieving secondary school students, regardless of their circumstances, access to the quality teaching they need to fulfill their potential, with an initial focus on science, technology, engineering and mathematics courses, said Matt Dolan, founder and CEO of the Global Teaching Project. For the 2017-18 school year, the project has worked with the Mississippi Public School Consortium for Educational Access to implement a three-year pilot program to teach Advanced Placement Physics 1 in rural, low-income areas with high schools that did not previously offer the course and where shortages of qualified teachers are most acute. The subject was chosen largely based on assessments by Mississippi educators of their most pressing curricular needs. “Multiple studies show significant benefits from taking AP classes,” Dolan said. “Students who do well on the exams significantly boost their college admission prospects, and possibly save money through expanded college scholarship opportunities and the ability to earn college credit without taking college courses. According to the College Board, the nonprofit that oversees the AP Program, more than 2.6 million U.S. students took an AP exam in 2017, but in Mississippi, only 10,580 students took such an exam. Only 527 Mississippi students took the AP Physics 1 exam in 2017, with only 175 passing. Students from consortium high schools in Aberdeen and Booneville, and Coahoma (Coahoma Early College High School), Holmes, Pontotoc, Quitman and Scott counties participated in the spring break program. The AP Physics 1 course is provided at no cost to students, schools or school districts. Funding for the consortium comes entirely from the private sector. The Jack Kent Cooke Foundation, which is focused on promoting educational opportunities for promising students from underserved areas, provided significant support to the consortium, Dolan said, and the Global Teaching Project has borne much of the costs itself. Although the AP class features numerous online components, it is not an online course. The lead instructor is Meg Urry, a professor of physics and astronomy at Yale University, who teaches primarily via asynchronous video but also has come to Mississippi to teach students in person. Students also are instructed through textbooks, online resources, physics majors from Yale and the University of Virginia who tutor through video conferences and virtual whiteboards, and on-site teachers. The Global Teaching Project plans to add more AP courses and school districts for 2018-19. The students who visited the UM campus during spring break came for a number of reasons, Dolan said. There was the objective of providing additional academic support and reviewing the AP Physics 1 material as the May exam date nears. The visit also provided younger, prospective students an understanding of what the course entails, and what students must do to prepare for that level of academic rigor. And, in some small respect, the three-day visit was designed to give high school students the college experience. “It was exciting to partner with the Global Teaching Project to improve access to higher education for some of Mississippi’s most underserved high school students,” said Robert Cummings, UM coordinator for the visit and executive director of academic innovation. “While it is painful to think that world-renowned researchers like Dr. Cavaglià are located just a few miles from high school students who might have no high school physics courses, texts or teachers, it is also equally rewarding to see the two come together. The visit included staying at The Inn at Ole Miss, a tour of campus, information from the Foundations for Academic Success Track and the Grove Scholars Program, a presentation from the Office of Admissions and lots of physics reviewing. While spring break on the UM campus is typically a quieter time, a pause to recharge, reevaluate and even relax before the sprint to the spring Commencement finish line, students spent part of their visit learning about physics from Cavaglià, a professor of physics and astronomy and principal investigator of the UM Laser Interferometer Gravitational-Wave Observatory Group. The LIGO Group – as it is known – is an active member of the LIGO Scientific Collaboration. Late last year, the LIGO Group, along with the Europe-based Virgo detector and some 70 ground- and space-based observatories, directly detected gravitational waves – ripples in space and time – in addition to light from the merging of two neutron stars. It was the first time that a cosmic event has been viewed in both gravitational waves and light. To demonstrate how gravitational waves are detected, Cavaglià asked for some music from the students, and Bleu was cued up. With Bleu’s music playing, rain beat down outside Brevard Hall, reminding everyone that spring break arrives at the tail-end of winter, but the students did not notice – their minds were focused on Cavaglià and the oscilloscope. The morning’s lesson did not end with gravitational waves. Cavaglià, with assistance from physics graduate student Lorena Magana Zertuche and undergraduate physics major Renee Sullivan-Gonzalez, also demonstrated what a black hole is, worked in references to “Star Trek” and “Star Wars” when discussing warping space, and offered students career advice. They even discussed how a physics education could lead to working for Pixar Animation Studios, creator of such films as “Ratatouille,” “Up” and the “Toy Story” franchise. Sure, Cavaglià could have been busy during spring break furthering his groundbreaking research, but as a scientist, he said it was very important to talk to students and let them know what he does. “I always felt outreach is an essential part of the education process,” Cavaglià said. “Moreover, explaining current astrophysics research to students may help with recruiting in the sciences. 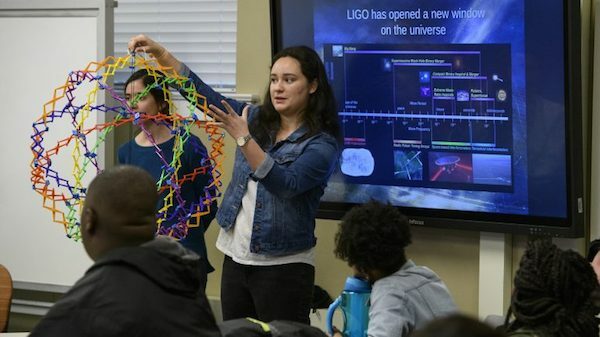 Whether it was hearing the “chirp” that a gravitational wave creates or answering questions about dark matter and the big bang, Cavaglià kept the students enthralled, including Diem Mi Pham, an 11th-grader at Scott Central High School.